Birch Lake is located three miles north of the Village of Elk Rapids in Antrim County. 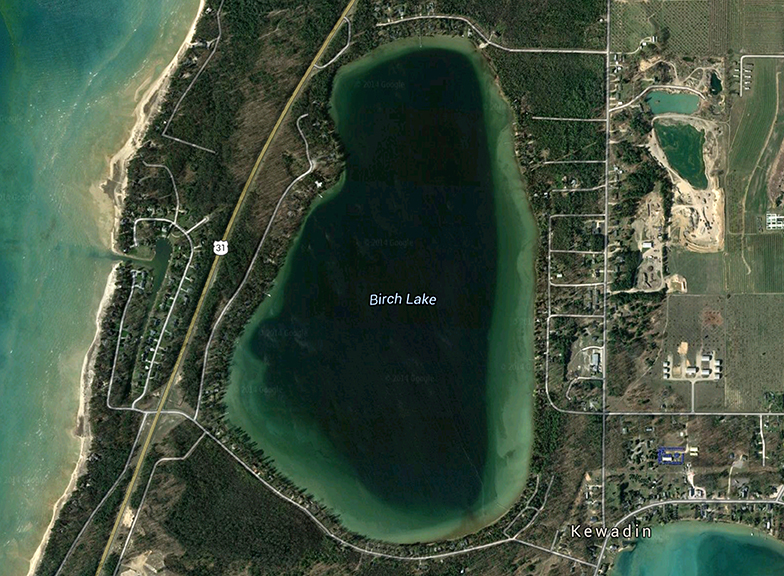 It is a mere 1500 feet from Elk Lake, yet only 1700 feet from Grand Traverse Bay. Higher elevations in the landscape between Birch and Elk Lakes result in Birch Lake being a small coastal watershed of Grand Traverse Bay. Birch Lake is a seepage lake with no major inlet or outlet streams. Therefore, water levels are largely controlled by groundwater inputs and outputs, precipitation, and evaporation. A rest area with scenic views of Birch Lake is located on the west shoreline off of US31 and there is a MDNR public boat launch in the northwest corner of the lake. Known Aquatic Invasive Species: None. Birch Lake is monitored every three years through the Watershed Council’s Comprehensive Water Quality Monitoring (CWQM) Program for dissolved oxygen, specific conductivity, pH, nitrate-nitrogen, total nitrogen, total phosphorus, and chloride levels.